For sixty years now, the McLean Hall has been at the centre of Fearnan’s social life and its leisure activities. The availability of a communal space has allowed groups such as the Bowling Club, the Art Club and the Book Club to flourish and residents have been able to enjoy activities, including country dancing, badminton, line dancing and more recently Tai Chi, literally on their doorstep. It has hosted dances, ceilidhs, coffee mornings, weddings and wakes – and let’s not forget the annual Pudding Night, the BBQs and the suppers. 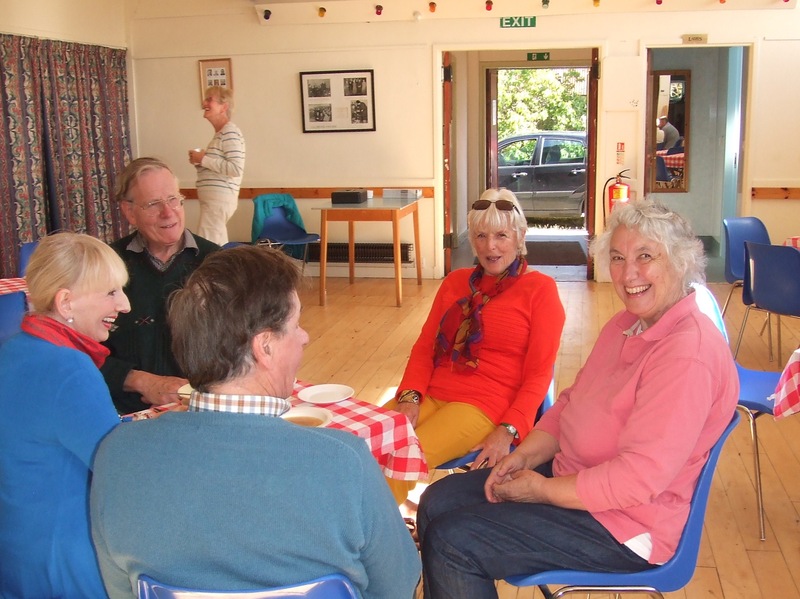 Unlike many other village halls, the McLean Hall was not sponsored by a benefactor or gifted by a local landowner, and the fact that it exists at all was down to the considerable efforts of those who lived in the village some 60 years ago. Although the Hall first opened in 1955, fundraising had started many years before, with the first recorded donation being £6 invested by the WRI for the proposed Fearnan Hall in 1931. The WRI also gifted crockery and utensils with the proviso that if the Hall did not materialise, the items were to be sold and the proceeds, along with the £6 donation, were to be divided equally between Perth Infirmary and Aberfeldy Cottage Hospital. The idea of a village hall had gained momentum over the years, and grew out of the strong feeling that the residents of Fearnan were considerably disadvantaged by the lack of an adequate communal space. 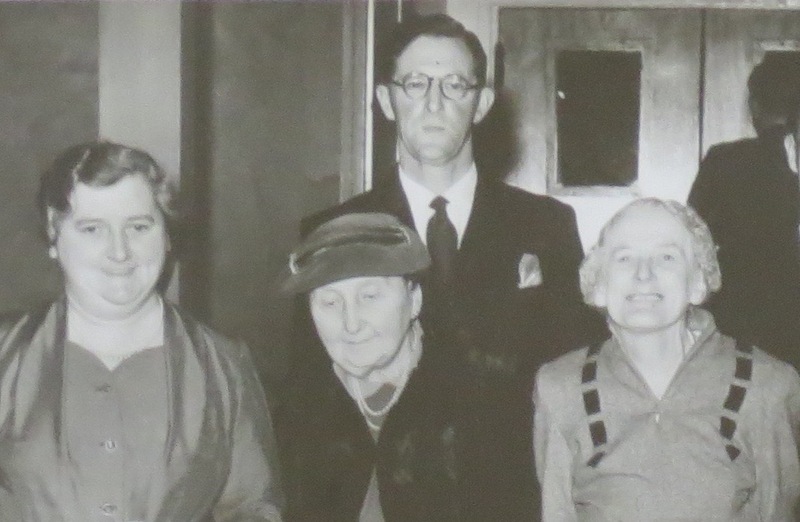 A Hall Fundraising Committee was convened in the late 1930’s, with Mrs Hodgson being the President and John McLean appointed as Secretary and Treasurer. Prior to WW2, the Secretary of State for Scotland had powers to aid the establishment of community centres, village halls, playing fields and other facilities for recreational purposes. Rural communities with less than 4,000 residents were able to apply to the Village Hall Scheme, administered by the National Council of Social Services (later to become SCVO), for financial assistance. The assistance came in the form of grants from the Carnegie UK Trust, and interest-free loans from the Treasury. The outbreak of war affected plans for a hall, and fundraising priorities changed. 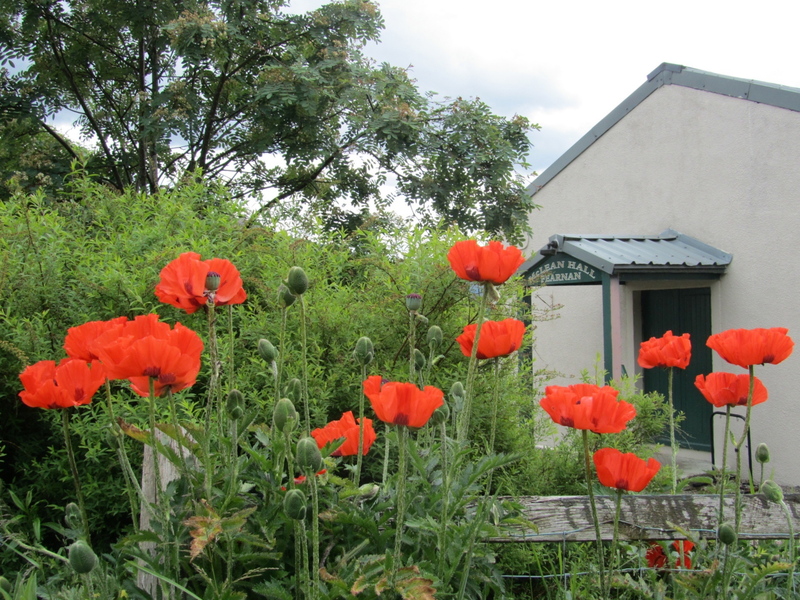 The village did, however, raise funds under the banner ‘Save the Brave’ for the war effort and at the end of the War, with the money no longer required for its original purpose, it was agreed that the surplus should be added to the village hall funds. A suitable site for the hall was critical. At that time, much of the land around Fearnan was owned by the Forestry Commission and, following representations made by the Village Hall Fundraising Committee in 1945, the Commission agreed to gift land for a hall, although it was not until 1952 that the final site was agreed. In the meantime, the Carnegie grants had come to an end and although some government assistance continued for a while, by 1949 this also had ceased because of the post-war scarcity of building materials and village halls were not considered a priority in the face of this shortage. Happily, in 1953, things suddenly started to move more quickly. First of all, the Village Hall Scheme was re-introduced, but on condition that the recipients could find their own labour and materials and raise a proportion of the capital costs. The National Council of Social Service would provide successful applicants with advice on plans, and a capital grant of up to three-quarters of the cost of a centre. In October 1953, the news came that Fearnan had been allocated funding under the revised Village Hall Scheme! The Agreement with the National Council of Social Service states that the Hall would be built and then made available to the Trustees of Fearnan Village Hall for a rent of £6 10/- payable twice a year in November and May. After ten years, there would be an option to purchase the hall. In November, Perth & Kinross County Council granted planning permission and the building company, Messers Duff, was appointed. The first two Trustees for Fearnan Village Hall, Alastair Duncan Millar (County Councillor) and the Reverend Kenneth McVicar, Minister at Kenmore Church, signed the formal Deed of Trust in May 1954. 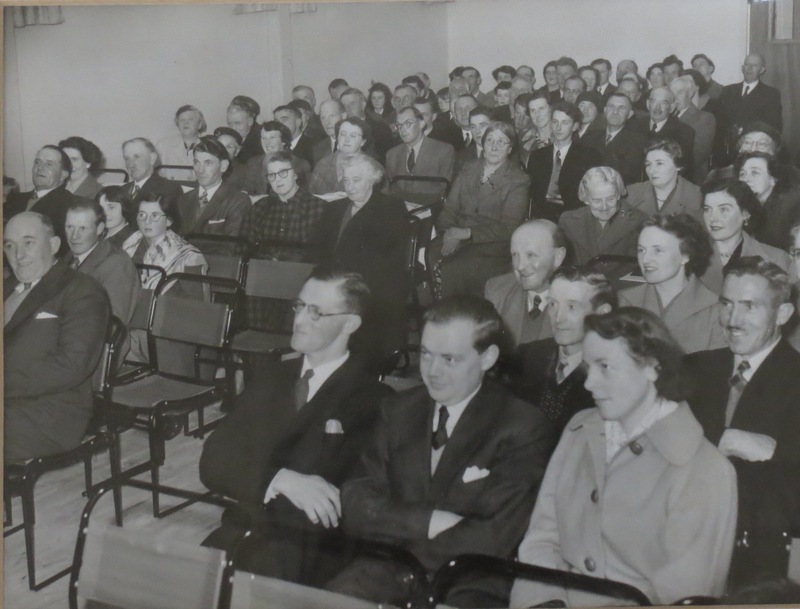 The opening of Fearnan Hall was celebrated on the 4th November 1955 and by this point the Hall Fundraising Committee had raised an impressive £1600 towards the cost of the hall – to put this in context, that is the equivalent of over £30,000 today! In addition, the Committee had some £500 (£9,000 today) for decoration, furniture, a piano, tea making equipment, fencing and legal fees etc. At a meeting the following week, the Steering Committee stood down and the new Hall Committee was appointed, with John McLean in the Chair. And so the Hall, then known as the Fearnan Hall, assumed its important role in the life of the village. It was soon hosting Whist Drives, Summer Fêtes, and Dances, with dance bands being brought over from Dundee. Social and recreational groups were offered a free initial meeting to help form clubs and groups. One of the regular users was the Kenmore Branch of An Comunn Gaichealach, particularly following the closure of the Holder Hall, Kenmore, in the early 1960’s. From that point, Fearnan Hall became the regular venue for the Branch’s Ceilidhs. A very memorable occasion occurred in 1966, when Mary Sandeman, who lived on the south side of Loch Tay, won the Mod Gold Medal. The celebrations started with dinner at the Tigh an Loan Hotel then processed up the hill to the Hall, following the pipes. Mary Sandeman was carried round the Hall to great cheers and then the Ceilidh started. A packed house of 250 people had a marvellous evening’s entertainment to be long remembered. The Hall’s original Feu Charter had a clause forbidding the sale or consumption of alcohol in the Hall and this stood until the 34th AGM in 1989. At this point, the Rev McVicar cautioned the Committee to be “stringent and sparing” over the use of the licence! Another change is that dances no longer include “Ankle Competitions” for the ladies or even Fancy Socks Competitions for the men, as they did in 1958! In spring 1963, in line with the original agreement, the Scottish Council of Social Services offered the Hall Committee terms for the purchase of Fearnan Hall. The Trustees advised the Committee to request a valuation of the Hall and also to ask if a continuation of the rental agreement was also a possibility. The valuation was duly done and the Hall was offered to the Committee at 40% of the figure with an option to pay over 5 or 8 years. It was decided to pay £154 initially and to pay the balance over 5 years – although in the event, the debt was cleared in 3 years. The Hall now belonged to Fearnan! The two trustees hold it in trust for the people of Fearnan, while the Hall Committee is responsible for the running and maintenance of the Hall and for ensuring that there are sufficient funds to cover the costs. In the late 1990’s the Hall was renamed and is now known as The McLean Hall, Fearnan, in recognition of the enormous contribution made by John McLean both in raising funds and negotiating the establishment of the Hall. John had died in April 1986, and the following month the John McLean Memorial Fund was established and realised a sum of £686. The Hall Committee determined to use the money to build an adventure playground on the land adjacent to the Hall in John’s memory and, with the help of the District Council, Army Cadets were brought in to construct ‘Fort Fearnan’ in July 1989. The Cadets slept in the Hall during the 2-week period of construction. A garden seat was also donated in John’s memory, which now sits at the entrance of the Hall. So for about 6 years, Fort Fearnan stood as a memorial to John McLean, but by April 1995, it was found to be in a dangerous state, the wood not having been properly treated when it was built. The Fort was dismantled and although recompense was sought from the District Council, the Committee eventually had to settle for the installation of the children’s Swing Park, rather than a rebuild of the Fort. This meant that there was now no proper memorial to the driving force behind the Hall and, in April 1999, committee member Elizabeth McDiarmid suggested that a plaque be mounted in the Hall to commemorate John McLean without whom there would be no hall. This led to the decision later in the year that Fearnan Hall be renamed The McLean Hall, Fearnan. There can be no doubt at all that the Hall is a valuable asset to the village. Those of us who benefit now from the social links that it helps to form and maintain have good reason to be grateful to our predecessors for their foresight, vision and commitment. Some sixty years later, it is the Hall alone that remains to serve the village, the hotel, the school, the shop and Post Office all having closed. Recently, the Hall underwent a major refurbishment that will ensure that it remains fit for purpose and can continue to contribute to village life for generations to come. The Hall’s 60th Birthday Party, hosted by the present day Trustees and Hall Committee, will be held on Sunday 1st November at 2.30pm. An occasion well worth celebrating! This interesting and meticulously researched post certainly enhanced my Sunday morning. Not only did I find the details of the hall’s inception absorbing but the photos of some of my old neighbors, school friends and acquaintances touched me profoundly: Childhood friend and mentor Chrissie Brace, (nee Butters) from Springbank Cottage, “Dolly” Stewart from the hotel, John McLean (known affectionately as” Johnny”) the Grindley children, Catherine McDougall, schoolteacher Miss Maynard, Andy Dot, and I’m certain I recognize a schoolmate Billy Ross — so many memories.